Google today launched an upgrade to its Google Play Books store for Android that will make it easier to read comics on your phone and tablet. 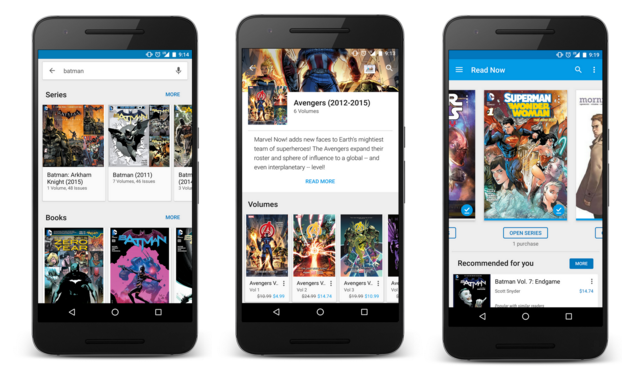 The company also today introduced personalized comic recommendations to make it easier to find similar series, as well as a set of curated series pages for comics in the Play Store. All of these updates are now rolling out on Android for users in the United States, Canada, Australia, Great Britain, India, Singapore, Ireland, New Zealand and South Africa. As Google’s lead product manager for Play Books Greg Hartrell told me earlier this week, this is the first update to Play Books that was specifically meant to improve the comic-reading experience. “This was largely born out of the fact that comic books are hugely popular as a category on Google Play,” Hartrell told me, adding that comic book readers turn twice as many pages as others on Google Play Books. Given the nature of comic books, that may not necessarily come as a surprise, and Google hasn’t released any other stats about the popularity of different book categories in its store. Hartrell did note, however, comics easily rank among the most popular categories in the store. Reading comics (or graphic novels, if that’s more your thing) on small screens has never been ideal. The new reading experience on Android (with iOS support coming soon) will pop up when you are in landscape mode. In this mode, you can now easily scroll through a story with just vertical swipe. As Hartrell told me, the team developed this new reading mode by looking at how existing users were reading comics on Google Play (using “good old-fashioned usability studies,” as he put it). As for the new recommendations and curated series pages, Google says the aim here is to simply make browsing and finding interesting comics to read easier. It’s worth noting that this new feature is currently only available for some of the more well-known publishers in Google’s catalog. These include the likes of DC Comics, Marvel, Image, IDW and Dark Horse. The new reading experience is available for books from all publishers.